Amelia was so loved by her family, and by her two boys, Leo and Wesley. Amelia went to go meet her darling Leo, who we lost to sudden-onset pneumonia in March, at the bridge on July 23. Wesley (Earl Grey) is left behind, and we have been giving him as much love as possible. After Amelia was spayed, she had regular problems with bloating. We did our very best to stay on top of this, but unfortunately we lost Amelia to this problem on July 23, 2006. Sadly it turned out from her necropsy that her uterine stub had grown into her intestines, which is what constantly caused her to go into bloat. She is missed terribly, we loved her very much and will do so always. You can see pictures of her with her boys here. This adorable very small bunny was brought in starving and emaciated, along with an already deceased companion. She had over 1-inch long nails that had never been cut and her fur was dull and thin; you could feel every bone in her body. Amelia's foster family has spent the past month nursing her back to health and happiness. 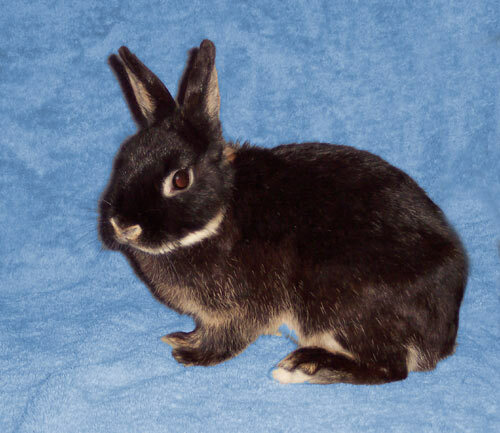 She's now spayed and an extremely special bunny with a sparkling personality, shiny velvety fur, and she loves to be held. She dances with joy, rolls over onto her back, plays with her toys, and loves to run. She would make an excellent friend for you... wouldn't you like to meet her?